Seldom see me in CAP and Without Make up ? Here is a picture of me without make up ! Any Big difference ? Do tell me what you think. And this time of trip , we took the Ferry ! It took us so long to wait as we arrive the first badge just left. But then as I recalled when I was young, the ferry still look the same ! They only repainted it. WOW ! such ferry could last for years ! Btw .. its only RM7.70 per trip same like the toll fee for going in and out of Penang ! The rest of my time I went shopping at Komtar mall and First Avenue and got my self a Pair of Mashai Shoes from Larrie ! It was SUPERB COmfort and Best of all ! Its good for my HEALTH! Gonna wear this shoe to AUS ! And Air Hitam was famous for their LAKSA ~ and Its TRUE !! I remember to take their picture cause so many people were taking their pictures too !! Here~ The yummy Laksa !!!! We saw this advertisement and found this place !!!! 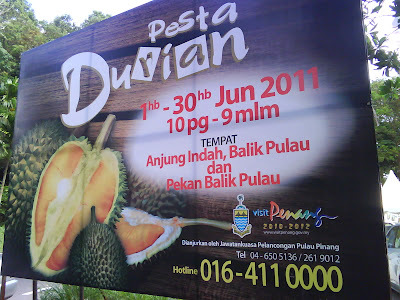 WEEE DURIAN FAIR!! 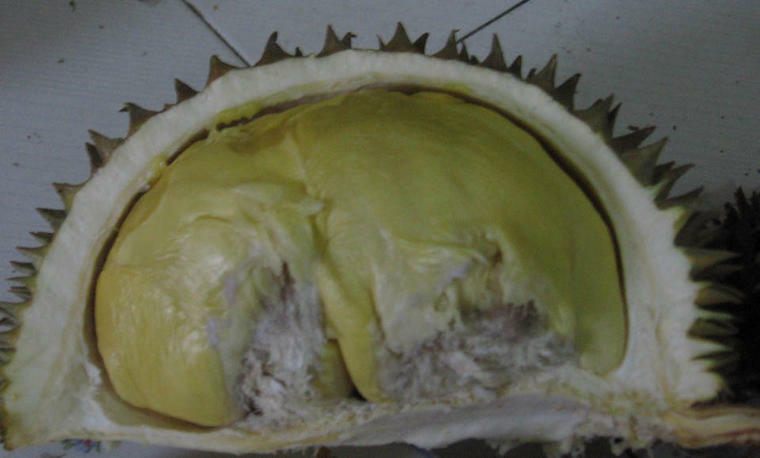 They only sell BRADED DURIANS ( No Kampung ones~ ) and we ate like 3 Durians ! SEE the nice view behind me ~ Nice eh! Nvm I’ll do again and Do a better one but time is LIMITED !!!! Tuesday Im leaving and I have to pass em up tomorrow !! Im gonna burn midnight oil tonight I suppose !